If you asked my friends and family to choose 100 words to describe me, risk-taker wouldn’t make anyone’s list. I like to take things slowly, mull over ideas, analyze them to death, and then consider all possible outcomes. If the opportunity hasn’t passed by then, I make my move. It should come as no surprise with an operating system like mine that it took 9 months to decide to begin my blogging adventure. The only way I could make this idea palatable was if I promised myself that I would only experiment with blogging for the summer and, in the event of public humiliation, the real me could hide behind Paprika. Creating the blog on WordPress took another few weeks. After all of that cogitation, I still had to find the mental energy and creativity to write a post. Finally, on June 17, 2011, I clicked the publish button for the first time then demonstrated superhuman strength to suppress my urge to vomit. Once my finger released that key, I knew there was no going back. My words would be out there floating around the blogosphere never to be reeled back in. Anyone could read them, or no one would read them. I wasn’t sure which would have been worse. Not knowing any other bloggers, I was in completely uncharted waters and had no idea what to expect from this experience. I should rephrase that and clarify. I did have expectations; a very long list of bad expectations. What never made my list of expectations was that one year later I would still be writing Good Humored and people would be willing to read it. I have a lot of people to thank for helping me reach this milestone and proving to me that sometimes, I am my own worst enemy. My friends and family were my first readers. They kept coming back each week even after I stopped bribing them to read. My mother-in-law, Rosemary, forced encouraged her friends to read my blog by inundating their e-mail inboxes until they gave in and subscribed. Soon after that, other bloggers started to find Good Humored. They left “likes”, took the time to write comments telling me how my story reminded them of something in their own lives or that I had made them laugh. They offered me awards and recommended me to their readers. All of that collective kindness and generosity gave me the confidence and encouragement I needed to keep writing. My expectations about the blogosphere couldn’t have been more wrong and it has left me at a loss for words, except for these two: thank you! Posted in Uncategorized and tagged bloggers, blogging, blogosphere, discovering new blogs, expectations, humor, life. Bookmark the permalink. this is a bit late in coming, as i have been a blogging hiatus. but it comes from the heart. you have a gift, Paprika, and it is a joy to read your blog. am so glad you were freshly pressed on your “L’what” post, otherwise i probably would be missing out on all your misadventures. happy 1st blogiversary!! Thank you so much your truly kind words. You can’t tell, but I’m blushing. It’s been encouragemnt and support from readers like you that have made me continue blogging. I’m glad you enjoyed the post. Thanks so much for stopping by to read and comment. It’s summer and I’m trying to catch up on all the posts I missed. Happy Birthday and many more! I’m so glad you read this post and thought it was helpful to you as you begin your blogging adventure. Not only did I not know any other bloggers, I had never even read a blog when I started my own, so you are already ahead of me on the learning curve. haha I am so pleased I am not the only one that has begun this way! Any tips you could chuck my way on getting a blog up and running would be really appreciated! I’d be happy to “chuck some tips your way”, Holly. Do you mind if I send you an email instead of doing it through comments? I can use the email that pops up when you leave a comment. I am late to wishing you happy birthday, sorry. I am slow on my reading list catch up this past week. Bad bad bad. I do so enjoy your blog though, it is okay to not be a risk taker at least in this case. Look at the wonderful outcome! Never worry, Valentine, kind words are gratefully accepted regardless of the timing. Thank you for taking the time to read and let me know that you are enjoying the blog. Happy 1st Blog Birthday! Quite a milestone and certainly one worth celebrating. Here’s to many more! You not only made it to the one-year anniversary, but you’re a big success. No surprise to us! Congratulations! It’s a good thing I have such wonderful friends who had such belief in my ability to do this. It gave me the courage to try. Thanks! Happy Birthday!!! So proud of you and keep the laughs coming!!! Congratulations Paprika! You are so confident and funny! Thanks, Rumpy! I’m glad that it appears that I am confident because that is definitely not how I feel. Got me fooled! woo woo woo! Happy anniversary– I look forward to each new post. The world can never have too much laughter. Many happy blogging years (and a book or two) to come! Thanks, Melanie! It makes me happy to know that you look forward to my posts and that they make you laugh. The blogging for many years I have some control over, the book deal, not so much. Congrats on completing your first year. Onward and upward! It’s been a great year, and your stories have only gotten better. You have such a wonderful, humorous-without-the-nasty touch to your writing. And you are so encouraging to me and other bloggers. You were one of my first followers, too! Thanks, Paprika. Many many more blirthdays, blogoversaries or whatever you want to call them! Thanks for being such a loyal reader, Elyse. I know how important it was/is to me to read encouraging comments from readers so I make an effort to pay that forward. Writings a lonely business without the comments from readers. I’ll try to keep ’em coming. If I’ve learned anything in this past year it’s that my life certainly provides me with plenty of material. Congrats on your first anniversary, Paprika! Mine is also near– I wonder if our blogs share the same sign? 😉 I know we do share plenty of other things — humor, friends, place, etc. and it’s been a joy to get to know you better through blogging. I’m glad this has turned out to be such a positive experience for you and I wish you many more happy posts! Thanks, Lisa. We do have a lot in common, but I’m guessing we would have never crossed paths in the real world. I’m glad I found your blog and then you as a friend. It’s helped me to grow as a blogger. It’s comforting to know I have someone I can talk to who understands blogging. Good for you! I’m new to your blog and new to blogging as well. I could identify with your initial feelings. Are you a Libra by any chance? Cheers! Thanks! It’s been really great to hear from other bloggers that they had similar feelings when they began their blogging adventure. If I had known that when I started blogging, I might not have been so hesitant about starting. Thanks for subscribing. I hope you’ve been enjoying the posts. The real me is a Taurus not a Libra. Paprika was born in June so I’m not sure what the makes her. 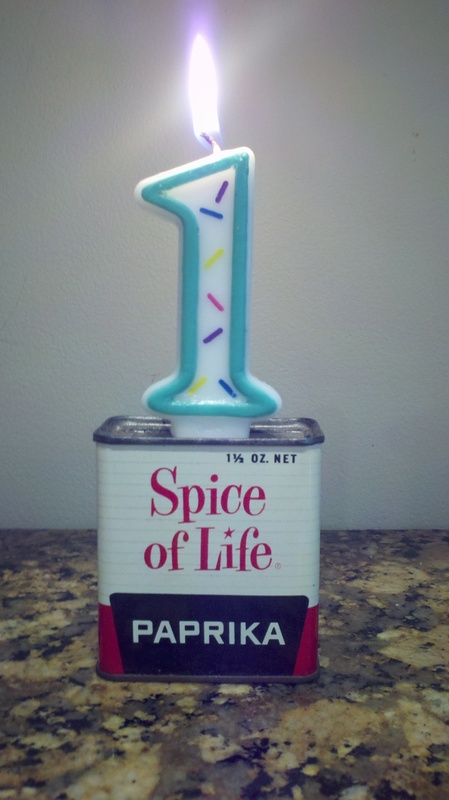 Happy blogoversary, Paprika! Atta girl! Mine is next month — it must’ve been a good time to start a blog last summer 😉 Cheers! Nope, not an old pro — I’m a big dummy. I don’t have a clue what I’m doing. Maybe this next year, I’ll finally learn how to change my font. You can change the font? Well, now I have a goal for the next year. My blog’s font looks like poop. We can learn together. I didn’t know you were so new, either, Angie. Last year was the bomb for bloggin’. Absolutely. Thanks for always telling me the emails I sent you were funny enough for a blog. You are an original spice girl! The light of your column still burns bright after one year (it must be one of those trick candles that never goes out). To paraphrase that motel commercial, I hope you’ll “keep the light on for us.” Congrats and here’s to many more. Hooray! Party on…but come back to write – you spice up the bloggersphere. ( and yes, the dead deer….drop dead funny.) Thanks for all the chuckles! Happy Anniversary! I can’t wait to revisit my first year in blogging. It’s been a tremendously rewarding experience. Glad to have met you. I so enjoy what you do! I’m so proud of you for sticking with it for the entire year, and I look forward to many more blog posts in the years to come. You forgot to mention the people who became subjects of your blog posts (ahem, me, ahem), but I already know that you are grateful. I’m more than happy to paticipate in the fun. Keep up the great work! Congratulations!!! I am also glad you took the risk! I also never realized blogging would be so fun!!! Thanks! Taking the risk to do this has been quite a life lesson for me. I learned that I can step outside my comfort zone and instead of being uncomfortable, I wind up making my comfort zone even larger. Congratulations, Paprika. 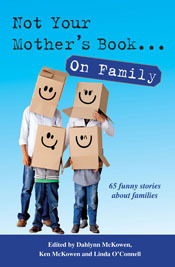 I’ve enjoyed your humorous and thoughtful stories, and I look forward to many more. And thank you to you. I started my blog several months after you and you were one of my first subscribers. You already knew the importance of the like button and comments for fragile beginners and were so kind to encourage. My favorite of your posts is still the dead deer one although the hot toilet was good too. Keep them coming! I remember when you started your blog last fall. I love your blog and was happy to subscribe. I’m glad we’re both still at it. Thanks for letting me know which of my posts were your favorites. I don’t want to disappoint you, but I’m hoping there isn’t a sequel to the deer post. I am so glad that you took the chance and blogged that first blog. You have brought smiles to many a face. You’ve got a talent that should be expressed. Cheers to the next blogging year! Thank you for your kind words, Ronnie. I’m so happy to have you as such a loyal reader. “Paprika” – you ARE a risk taker, always up for a challenge, no matter what gets in your way. I’ve known you since we were babies, sharing Opa’s big, black, leather chair. (You remember?) Anyway, I’m very proud to call you my literary hero, dear cousin! Thanks, Renee. You’re right. I definitely don’t shy away from a challenge I’m presented with, but I’ve never thought of myself as a risk taker. It’s nice to know you think I am. I absolutely remember sitting in Opa’s chair with you. There’s no one else I would have wanted to share it with. Thanks, you’re pretty spicy yourself and you’re married to the original herb. So, would you call Oregano a little off-shoot?!! LOL!! Thanks, Cheerio. You were the first official subscribed reader. About that book…are you volunteering to be my agent?